Origin and Habitat: This species was found on the coast of Uruguay. 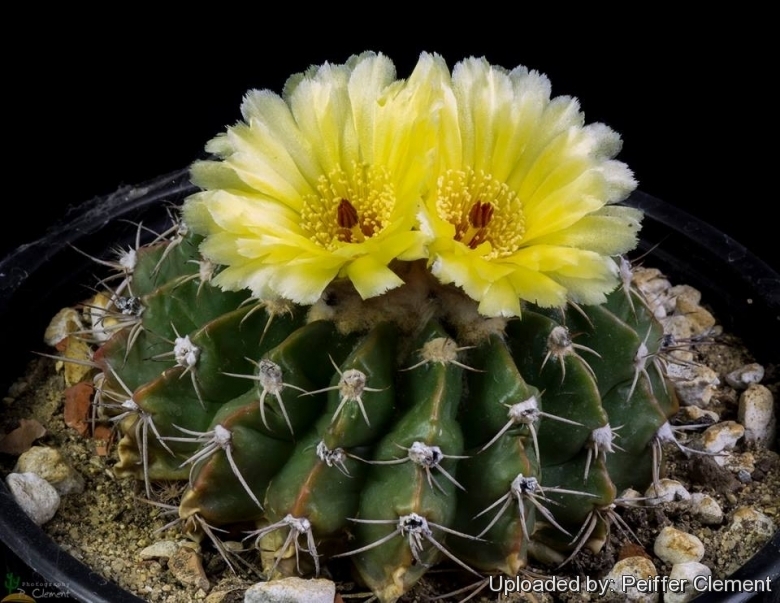 Description: Wigginsia fricii (a.k.a., Notocactus fricii, or Malacocarpus fricii) is a local or morphological form of the widespread and variable Parodia sellowii. It has spherical flattened stems, up to 10 cm in diameter with yellow flowers about 30 mm long, at the stem apex. However the distinguishing characteristics of Wigginsia fricii, appear to fall within the natural variation of Parodia sellowii and it should be synonymized with the latter. This species was found on the coast by Mr. Fric jr. K. Schumann has devoted it to him, but without describing it. Stem: Disc-shaped, about 4 cm high and 6-10 cm wide, glossy light or dark green. Crown woolly. Ribs: 15-20, tubercled, 10-12 mm high, edges very sharp. Areoles: 3-4 per ribs, over the the tubercles, nearly circular, very large, dense yellowish-white, woolly. Radial spines: 6-7, yellowish or whitish, unequal, curved, pliable, not piercing. Central spines: Absent or tiny. Flowers: Yellowish, around 3 cm long, sunken in the whitish (sometimes dark brown) woolly crown, and enveloped by a layer dark bristles. Outer perianth-segments yellowish or reddish. Inner perianth-segments delicate yellow, wedge shaped. Stygma lobes protruding above the stamens ring. Cultivation and Propagation: Wigginsia fricii is an easy to grow tropical cactus that like a warm bright location, but more cold tolerant than most. It requires a slightly acidic, permeable and nutritious substrate, regular watering and bright location. Fertilization: Feed it once during the growing season with a fertilizer specifically formulated for cactus and succulents (poor in nitrogen), including all micro nutrients and trace elements diluted to ? the strength recommended on the label. It thrives in poor soils and need a limited supplies of fertilizer to avoid the plants developing excess vegetation, which is easily attacked by fungal diseases.